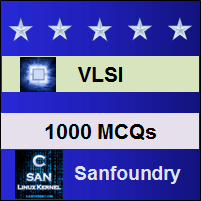 This set of VLSI Multiple Choice Questions & Answers (MCQs) focuses on “Limitations of Scaling -1”. Explanation: Built-in junction potential Vb depends on substrate doping level and this will be acceptable so long as Vb is small compared with Vdd. Explanation: As the channel length is reduced in a MOS transistor, depletion width must also be scaled down to prevent the source and drain depletion regions from meeting. Explanation: Supply voltage Vdd is scaled by 1/β. All voltages are scaled by 1/β. Explanation: If the substrate doping length Nb increases then depletion width decreases because depletion width is inversely proportional to Nb. Explanation: Maximum electric field can be given by 2V/d and this is induced in one-sided step junction. Explanation: The size of a transistor is usually defined in terms of its channel length L because feature size only gives area capacitance etc. 7. What is the minimum value of L to maintain transistor action? Explanation: The channel length L should be atleast 2d to maintain the transistor action and to prevent punch-through. Explanation: Channel length L depends on the supply voltage Vdd and substrate concentration Nb. Explanation: Carrier drift velocity can be given as the product of µ and E and the maximum carrier drift velocity is approximately equal to Vsat regardless of supply voltage. Explanation: The transit time can be given by L/Vdrift which is equivalent to 2d/µE as L = 2d and Vdrift is µE.